Cheap return flights from Prague to Kathmandu, Nepal from €426! Air Arabia offers the cheapest flights from Prague to Nepal in May and June, September, November and December 2019 or January to March 2020. Booking is only available directly with the airlines where you can easily compare all the cheapest travel dates and other options. 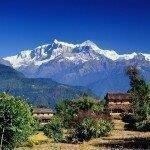 If you need affordable accommodation in Kathmandu you can use hotel booking sites such as Booking.com or Hotels.com. Booking sample of cheap return flights from Prague to Kathmandu, Nepal from €426! In this case you would depart from Prague to Kathmandu on Friday, 10th of May. Inbound flight from Nepal back to Czechia on 24th of May 2019.